For the first time in his own words, President-elect Donald J. Trump explains his plan to make America great again! He wants to "put America's interests first—and that means doing what's right for our economy, our national security, and our public safety." Throughout the 2016 campaign, Trump conjured images of American strength and culture when small towns boomed with industry, mom and pop shops bustled, and people said, "Merry Christmas!" The media scoffed at Trump's vision and the people who supported him; they were blinded by the Clinton machine. But their eyes were opened after Trump won 62 million votes and the Oval Office. Even Republican House Speaker Paul Ryan said, "Donald Trump heard a voice in this country that no one else heard." As Trump says in Time to Get Tough, "I've built businesses across the globe. I've dealt with foreign leaders. I've created tens of thousands of American jobs. My whole life has been about executing deals and making real money—massive money. That's what I do for a living: make big things happen . . ."
Trump is about to make the biggest deals of his life, and he's going to make them for America! From reversing lax immigration policies to eliminating regulations that restrict small businesses, Donald Trump understands that America "doesn't need cowardice, it needs courage." 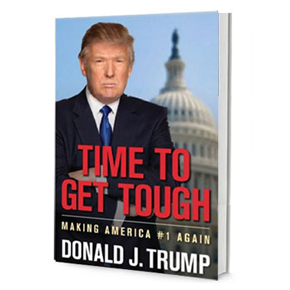 President Elect Trump is about to "Make America Great Again" and Time to Get Tough is his blueprint!